This is a favourable section of the draw for the likes of Venus Williams and Timea Bacsinszky. Venus opens against Peng Shuai – the Chinese player returned from nine months out (due to a back injury) in March and has won just two matches on the main tour. Peng’s been competing well but not winning matches. I’d fancy the first rounder with Venus to be very competitive. Bacsinszky was forced to retire from her first round match in Wuhan due to a viral illness. The Swiss player has a decent draw on paper but hasn’t won back-to-back matches in her last five tournaments. Caroline Garcia, as erratic as she can be, could be one to watch from this section. Agnieszka Radwanska and Caroline Wozniacki could play each other for the third time in as many tournaments if they both win their first two matches… those pesky draw gods! Radwanska’s suffered two tough losses in Tokyo and Wuhan having served for the match against both Caroline Wozniacki and Svetlana Kuznetsova respectively, even having a match point in the latter. The number three seed had shown some good form up till the critical moments, but season fatigue and a lack of ruthlessness have thwarted her. 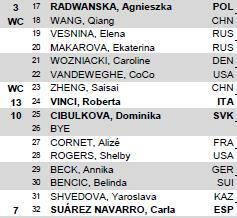 Radwanska plays Wang Qiang in the first round; the Chinese player reached a career high of #66 earlier this year through some excellent results on the ITF tour. If Radwanska were to get through her first round match, she could play Ekaterina Makarova again in the second round after the pair played in Wuhan last week. Makarova would first have to overcome her doubles partner, Elena Vesnina. The Wimbledon semi-finalist, who missed Wuhan due to lower back injury, defeated Makarova in their last match-up at SW19 in one of the best matches of the tournament, 5-7 6-1 9-7. It was a noteworthy result because Makarova had won their last six matches prior to their Wimby clash. Wozniacki was clearly fatigued in Wuhan after her triumph in Tokyo but still won two matches to reach the third round where she lost to Radwanska in straight sets. After a couple of days of much needed rest, she plays CoCo Vandeweghe in the first round of Beijing. This would seem to be an ideal opener on paper with the American on a four match losing streak. The winner of this match will play the winner of the first rounder between Roberta Vinci and Zheng Saisai. The Chinese player, like Vandeweghe, is also on a four match losing streak. The Wuhan finalist, Dominika Cibulkova gets a performance bye into the second round where she could face a rematch with Alizé Cornet in the second round; Cibulkova beat Cornet in the first round of Wuhan, 6-2 2-6 6-3. Cibulkova is likely to be knackered so i’d like Carla Suárez Navarro, who has been very solid of late but missing the big win, to take advantage. Yaroslava Shvedova won’t be a straightforward first round match by any means but the Spaniard is doing so much better compared to this time last year. 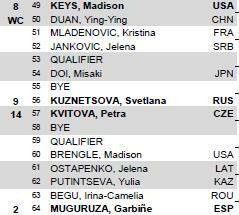 Also worthy of a mention in this section is Belinda Bencic – i’m stunned she’s even in the draw after retiring from her first round match in Wuhan against Svetlana Kuznetsova after a heavy fall, injuring her coccyx. I have no idea what to expect from BB against Annika Beck in the first round. Urgh… why do the draw gods hate Lucie?! For the second straight week, Lucie Safarova will play Karolina Pliskova. Safarova, who recently parted ways (via Czech media) with her coach Rob Steckley, hasn’t won back-to-back matches in singles since Wimbledon. To be fair, her draws have been rough – Eugenie Bouchard, Andrea Petkovic and Dominika Cibulkova have all been first round opponents and when’s she managed to get through her first round, Simona Halep or Pliskova have been waiting in the second round. Johanna Konta, a reliable fixture on the WTA tour in 2016, is also present in this section. She faces an intriguing opener against Anastasija Sevastova, who defeated her in the fourth round of the US Open. Sevastova retired from her first round match in Wuhan due to a shoulder injury. Halep is the highest seed in the third quarter and has been consistently one of the strongest performers in WTA tournaments in 2016. Despite reaching the semi-finals in Wuhan, Halep suffered a comprehensive loss to Petra Kvitova, 1-6 2-6. Halep was very flat but then again, what can anyone do when Peak Petra shows up? Halep is set to be reunited with Darren Cahill in Beijing which should provide a much needed boost. First up in Beijing will be either Monica Puig or Yanina Wickmayer. 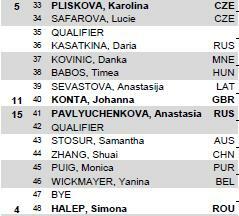 Also of note in this section is good friends, Zhang Shuai and Sam Stosur playing each other in the first round. Zhang, who has won at least one match at her last seven tournaments, beat Stosur at the US Open, 6-3 6-3. Two of the Wuhan semi-finalists, Petra Kvitova and Svetlana Kuznetsova, land in the fourth quarter of the draw with a performance bye. Kvitova has looked back to her best in Wuhan and could play Madison Brengle in the second round of Beijing; the pair have already played three times in 2016 with Kvitova bagging a first win over the American in Tokyo. Kuznetsova will play Misaki Doi or a qualifier in the second round. Keys will play Duan Ying-Ying in a first rounder that will see the balls take a battering. The winner plays the victor of one of the most interesting first round matches between Kristina Mladenovic and Jelena Jankovic. JJ loves WTAsia, but looked fraught with nerves at the end of her three set loss to Barbora Strycova in Wuhan. Still, the last two weeks have surpassed anything she achieved through the first eight months of 2016. Mladenovic continues to struggle in singles – she’s so talented but hasn’t managed to push on in 2016 after an encouraging 2015 season. 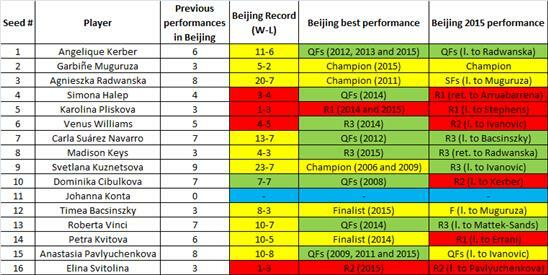 There are some ropey records in Beijing – only five of the 16 seeds have ever made it past the quarter-finals. 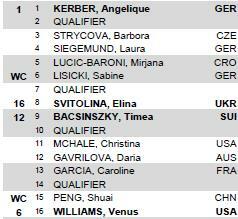 The world number one, Kerber has never won more than two matches in Beijing. In what will be her 10th appearance in Beijing, Kuznetsova has the best record of the 16 seeds with 23 wins and two titles although the last of those came all the way back in 2009. Pliskova has never made it past the first round meanwhile Konta is playing the tournament for the first time in her career. Who do you think will win Beijing? Have your say in the tournament poll below and as always, comments are appreciated! If you are entered into the Tennis Draw Challenge game, remember to get your picks now HERE! September 30, 2016 in Tournament Preview, WTA, Wuhan. I dont want to jinx Kuznetsova but she has a pretty great draw there, on paper. I believe she’s won more matches than any other (female) player in Beijing. She’s won twice and also been runner up twice. Barring any potential injury, she’s in good form for this one! It’s absolutely amazing what Domi has achieved in this tournament – three good wins in two days! She knows that she’s in with a shout of qualifying for Singapore this year, and for the first time, and my guess is that’s what’s driving her (or allowing her to drive herself) so hard. Marvellous performance from Petra too – I take back what I said about her having peaked at Wimbledon (come to think of it, she also peaked at Madrid last year, beating Serena amongst others). If Domi’s got any more energy left it should be a great final tomorrow. It’s extremely tough to say who can possibly win in Beijing now. Petra Kvitova really stunned me in winning in Wuhan earlier today, considering her form was just kaflooey since she got diagnosed with mononucleosis last year. But, I feel like maybe either Radwanska, Kuznetsova, or Cibulkova may win in Beijing. Both Kerber and Halep seem to be very inconsistent with their forms at some times. Halep has been incredibly consistent the past few months actually. And under the circumstances, Kerber hasn’t put up any poor losses in quite a while. Dammit, caught out by the early start and didn’t get my picks in! Not that Ive much of a clue about what will happen this week either !…but agree that the most consistent players seem to be Kerber and Halep . I feel your pain, Beijing’s a frustrating one as I remember it always starts on Saturday!